This past week was my first week of tapering. 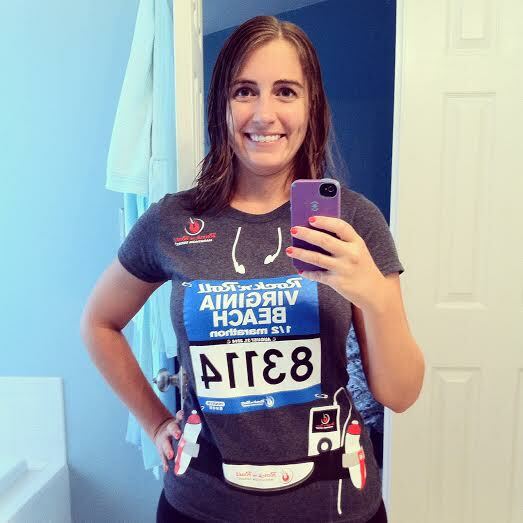 While some runners often find it difficult to taper, especially mentally since they think they need to run more, I definitely didn’t face a mental struggle this past week. I attribute this to the fact that since I’m going back to work today (the first day for my students is next Tuesday), I spent much of this past week trying to get a lot of errands and chores done. I also went into work three days this past week to get ahead on my lesson planning, which will hopefully ease my stress this coming week and as the new school year starts. I had plenty to keep my focus off of the reduction in my training mileage! Although I had planned to complete three runs this past week, I wound up only completing two. After my run on Tuesday, my right calf and foot started to bother me. It wasn’t anything significant, but with Virginia Beach this coming weekend, I didn’t want to push anything or risk injury. Instead of running on Thursday, I opted for the elliptical instead. I’m glad I listened to my body, and that my calf and foot felt fine during yesterday’s run after a couple of days of rest. Clearly my body needed the extra rest! The highlight of my training week was completing yesterday’s run with Preston. 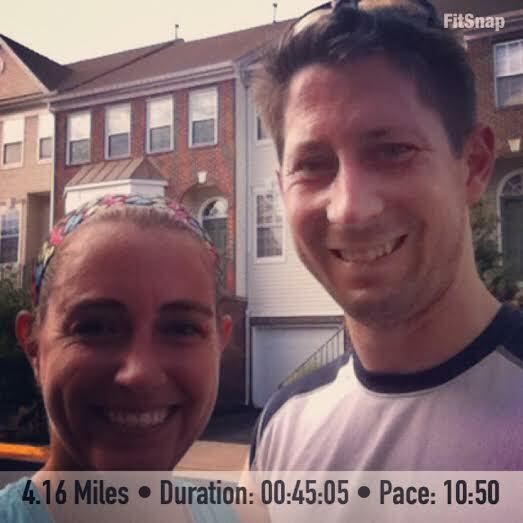 When I first started running, we completed a lot of our runs together. (Not all of them, since he was training for Dopey and I wasn’t, but it was nice when we did run together.) This summer though, Preston opted not to run much, but with the Army Ten Miler less than two months away, he’s starting to run again. I’m looking forward to even more training runs together. Its hard to believe that I’ve already reached week 18 of my training, and that in 6 short days I’ll be running my third half marathon! The countdown to Virginia Beach is on! QOTD: Do you find tapering to be a mental challenge? When tapering, do you err on the side of caution, or do you push through any pain? This entry was posted in RnRVB Half Marathon Training, Training and tagged elliptical, half marathon, half marathon training, half marathon training plan, Rock 'n' Roll Virginia Beach, running, training, training plan, treadmill, walking, weekly recap, weight training. Bookmark the permalink. Great job on your tapering. I don’t feel like I ever get enough training runs in before my race so I don’t normally taper. I think my whole training plan is a taper….haha. I still plan on doing one more long run in before the race on Sunday. Sometimes I don’t feel like I get enough training runs in either. Maybe we’re both too hard on ourselves? Great job tapering! I usually welcome the taper! And so glad your calf and foot are ok after some rest! Smart decision! Good luck going back to work this week! I’m so glad I listened to my body as well. I definitely didn’t want to risk injury when I’m so close to race day! I’m glad your foot is better! I love that training shirt 🙂 It seems crazy that the race is almost here when it seems like Summer just started. Good luck with the race! It definitely feels like summer just started! Tapering is hard for me sometimes. I think it’s the dancer in me who still gets obsessive about exercise. Good luck with the start of school! Boy summer went by quickly, seems like you just finished! Enjoy taper time. It definitely feels like last school year just ended! Tapering is definitely hard for me, I always seem to “discover” a new ailment which In reality is just my mind playing tricks on me! You are going to do great, and like you said, just listen to your body. You know you can do the mileage…rest that foot/leg, no need to panic!